The global agricultural films market was valued at US$ 9355.1 Mn in 2017 and is anticipated to expand at a CAGR of 7.4% from 2018 to 2026, according to a new research report titled ‘Agricultural films Market: Global Industry Analysis, Size, Share, Growth, Trends, and Forecast, 2018–2026,’ published by Transparency Market Research (TMR) The global agricultural films market is driven by the rise in usage of agricultural films to increase the agriculture output. Agricultural films are used extensively by rural farmers. These films are also employed widely in commercial agricultural practices. Demand for food items has been rising due to the growth in the global population. Key regions across the globe are focusing on maximizing the agriculture output. Mulching is a process of covering the soil and maintaining desirable conditions for plant growth by using agricultural films. It provides various benefits to crops. Usage of mulching, greenhouse, and silage bags boosts the production rate by 20% to 35%. Linear low density polyethylene (LLDPE) is a linear polyethylene that is commonly made up of copolymerization of ethylene with longer-chain olefins. LLDPE possesses higher tensile strength and puncture resistance than LDPE. In terms of production, LLDPE accounted for more than 60% share of the global agricultural films market in 2017. The agricultural films market in Asia Pacific is estimated to expand rapidly during the forecast period. Growth in population is fueling the demand for food in the region. This, in turn, is driving agricultural developments in countries in Asia Pacific such as in India. For instance, the Government of India has been striving to encourage rural farmers to adopt modern techniques of farming. It is encouraging the usage of agricultural films to enhance the production of crops, fruits, and vegetables. Increase in trend of commercial farming in developing economies such as China and India is a major factor augmenting the demand for greenhouse setups to control climate conditions in Asia Pacific. Based on application, the global agricultural films market has been divided into greenhouse, mulching, and silage. Greenhouse and mulching segments accounted for more than 75% share of the market in 2017 due to their wide consumption in farming. Mulching protects soil erosion. It also helps maintain the nutrient values of soil. Greenhouse films provide the climate control facility. 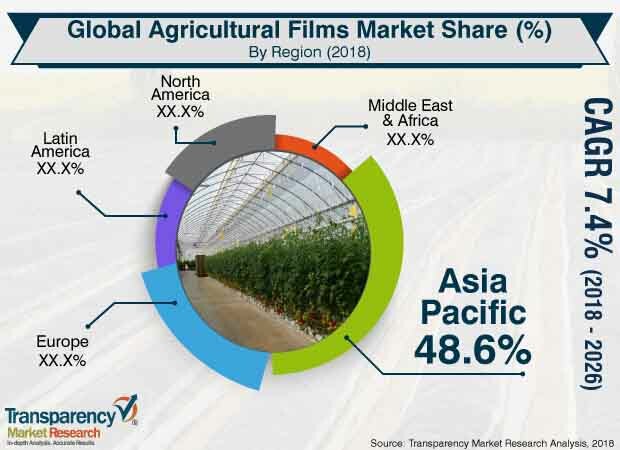 Based on region, the global agricultural films market has been classified into North America, Europe, Asia Pacific, Middle East & Africa, and Latin America. Asia Pacific is estimated to be the leading region of the global market during the forecast period. Growth in population is fueling the demand for food in the region. This, in turn, is driving the adoption of modern farming practices in Asia Pacific. More than 30% population in developing economies of Asia Pacific is dependent on farming practices. North America is a mature region of the global agricultural films market. However, rise in trend of rooftop farming and farming in urban areas is driving the greenhouse and mulching application segments in the region. High degree of competition exists among players operating in the global agricultural films market. Key players account for major share of the market. The agricultural films market is fragmented, led by the presence of large numbers of manufacturers. Key players profiled in the report are Ab Rani Plast Oy, Armando Alvarez, Berry Plastics, BASF SE, British Polyethylene Industries, Exxon Mobil Corporation, DowDupont, POLIFILM GROUP, ISTANBUL SERA PLASTIK, RKW Group, Novamont S.P.A., AGRIPOLYANE, RPC Group PLC, Kuraray Co ltd., and Trioplast Industrier AB.